Boeing’s already racked up record-setting orders of almost almost $100 billion for its latest airliner, an innovative updating of the venerable 777 that features increased efficiency, greater comfort and composite wings with folding tips. The 777X was launched at the Dubai Air Show, and if there is any doubt which region of the world is currently in the captain’s seat of the airline industry, the orders in Dubai should provide an easy clue. In just the first few hours of the show opening on Sunday morning, three Middle East airlines placed orders and commitments for nearly 600 airplanes from Boeing and Airbus. The new 777X set a record for the launch of a wide-body airplane with 224 orders and commitments alone from Abu Dhabi-based Etihad Airways, Dubai-based Emirates Airlines, and Qatar Airways. “We are proud to partner with each of these esteemed airlines to launch the 777X – the largest and most efficient twin-engine jetliner in the world, ” Boeing’s head of commercial airplanes Ray Conner said in a statement. The unveiling of the 777X comes at a critical moment for Boeing. With Airbus well into flight testing the new A350, Boeing has been at risk of losing market share in its most profitable segment, the long range twin-engine market. The A350 promises to be more efficient than similarly sized and equipped 777 airliners, something Boeing hopes to address with the updated 777X. Although the industry has long known Boeing planned an update, details were scarce and the company waited until its appearance in Dubai to give the project an official green light. The 777X is not a clean-sheet design like the slightly smaller 787 Dreamliner — an innovative all-new airplane that features composite construction, the extensive use of electrical instead of hydraulic systems and fly-by-wire control — but the 777X borrows heavily from its technology. Of particular note is the use of composite materials for the new wing, which, at 233 feet, is the longest ever for a twin-engine airplane. The long, tapered wing offers improved efficiency over the existing design, and is possible thanks to the carbon fiber composite construction that allows for its size, and the ability to flex upward during flight. The graceful curve of the wing during cruise is part of its efficient design. But such a long wingspan poses problems at airports. Most of the largest commercial airports can handle wingspans of no more than 214 feet (65 meters as defined by the International Civil Aviation Organization), which has been a problem for the massive Airbus A380. Due to its massive 262-foot wingspan, Airbus’ biggest airliner can fly to just 30 airports worldwide, six of them in the United States. Boeing wants to avoid that problem, so it employed folding wingtips. Just as Navy jets fold their wings to save room on aircraft carriers, the 777X will fold more than 10 feet on each wing tip before pulling up to the gate. Further efficiency comes from the General Electric GE9X engines, which Boeing claims make its plane 12 percent more fuel efficient than “any competing airplane” according to Boeing, presumably the Airbus A350. The new engine turns the GE90, used in the 777 and already the world’s largest jet engine with a fan almost 10 feet in diameter, up to 11. The new engine’s fan is 132 inches in diameter and uses many of the same design features found in the GEnx engine used in the 787. The Ge9X will produce similar power as the GE90, using much less fuel. Boeing announced two versions of the 777X. The smaller 777X-8X will have around 350 seats in typical configurations and a range of more than 9, 300 miles. The −9X will carry 400 people and offer a range of 8, 200 miles. This is the kind of range offered by current 777s that has allowed the growth of the middle east airlines. Middle Eastern airlines have steadily increased their reach worldwide, and have long called for airliners with better “hot” capability. The region’s high temperatures often limit the number of passengers and/or fuel the airlines can carry, because high temperatures limit a plane’s performance. The 777X is expected greater performance to compensate for hot climate, something that Boeing must balance with customers in other regions who would rather save fuel than have performance they don’t need. It remains to be seen where the new airplane will be made. Boeing was founded in Seattle in 1916 and has built most of its airplanes in the region. Every 777 — more than 1, 100 in all — has rolled put of its wide-body factory north of Seattle. Earlier this month Boeing offered a new contract to the union members who assemble its airplanes, but the offer was rejected. The contentious battle was the latest of many over the decades that has slowly seen Boeing move more of its work outside its original home state of Washington. Boeing says it plans to make a final decision on where the 777X and its composite wing will be assembled within three months, and the Seattle area remains an option. Other locations include South Carolina where there is already a 787 assembly line, Long Beach, California where the company’s military C-17 cargo plane is nearing the end of production, as well as other locations in Alabama, Utah and elsewhere. http://bigapplewindowcleaning.com/ tips on how to window cleaning. 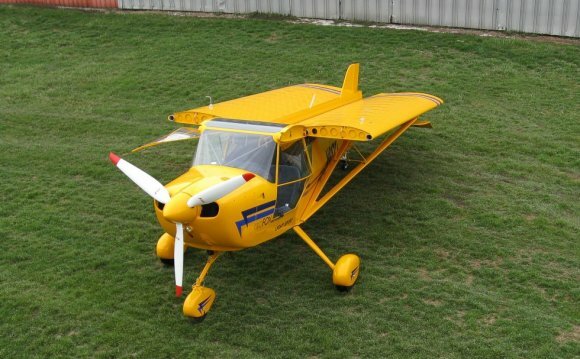 The Cvjetkovic CA-65 Skyfly is a 1960s American homebuilt monoplane aircraft designed by Anton Cvjetkovic.